In a rare Mendelian form of arterial hypertension, familial hyperkalemic hypertension, scientists have identified relevant mutations in WNK lysine deficient protein kinases 1 and 4 (WNK1 and WNK4) and in two proteins involved in the ubiquitin-dependent proteasome degradation of WNK1 and WNK4, including Cullin 3 (CUL3). To investigate why CUL3 mutations lead to a more severe phenotype, the authors developed cell models that overexpress mutant CUL3 and mouse models that express it ubiquitously or specifically in vascular smooth muscles cells. They provide evidence that CUL3-related hypertension is caused by alteration of both renal and vascular functions, the latter associated with activation of the RhoA signaling pathway. This dual influence helps explain the phenotype severity, but further investigation is needed to identify specific vascular CUL3 substrates. Background Mutations in four genes, WNK lysine deficient protein kinase 1 and 4 (WNK1 and WNK4), kelch like family member 3 (KLHL3), or Cullin 3 (CUL3), can result in familial hyperkalemic hypertension (FHHt), a rare Mendelian form of human arterial hypertension. Although all mutations result in an increased abundance of WNK1 or WNK4, all FHHt-causing CUL3 mutations, resulting in the skipping of exon 9, lead to a more severe phenotype. Methods We created and compared two mouse models, one expressing the mutant Cul3 protein ubiquitously (pgk-Cul3∆9) and the other specifically in vascular smooth muscle cells (SM22-Cul3∆9). We conducted pharmacologic investigations on isolated aortas and generated stable and inducible HEK293 cell lines that overexpress the wild-type Cul3 or mutant Cul3 (Cul3∆9) protein. Results As expected, pgk-Cul3∆9 mice showed marked hypertension with significant hyperkalemia, hyperchloremia and low renin. BP increased significantly in SM22-Cul3∆9 mice, independent of any measurable effect on renal transport. Only pgk-Cul3∆9 mice displayed increased expression of the sodium chloride cotransporter and phosphorylation by the WNK-SPAK kinases. Both models showed altered reactivity of isolated aortas to phenylephrine and acetylcholine, as well as marked acute BP sensitivity to the calcium channel blocker amlodipine. Aortas from SM22-Cul3∆9 mice showed increased expression of RhoA, a key molecule involved in regulation of vascular tone, compared with aortas from control mice. We also observed increased RhoA abundance and t1/2 in Cul3∆9-expressing cells, caused by decreased ubiquitination. 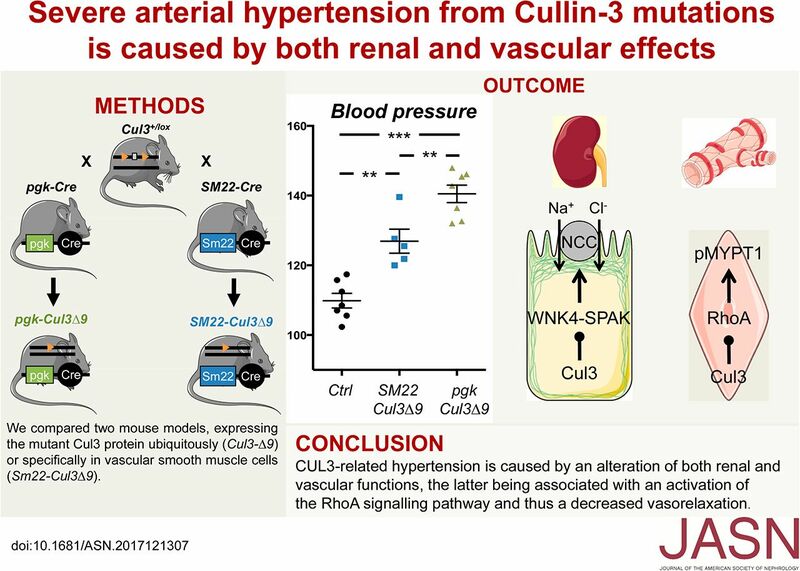 Conclusions Mutations in Cul3 cause severe hypertension by affecting both renal and vascular function, the latter being associated with activation of RhoA.